First, a short introduction to the author: He is a professor of physics and astronomy at the University of California-Irvine. He held a post-doctoral position at UCLA, is well-known for popularizing science for the public and has taught many online courses on the nature of science. Perhaps most impressive and startling, he has appeared on a number of television programs, including The Walking Dead, Spiderman Tech, Batman Tech, Star Wars Tech and Ancient Aliens. Besides all that, he is a faithful Roman Catholic. Divine Science is written for people of faith and people of science, who often view one another with suspicion and even disdain. 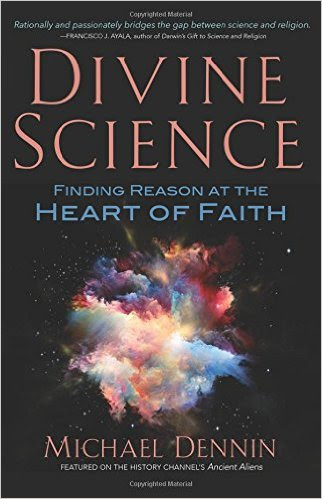 However, what Michael Dennin clearly and persuasively explains is that science does not deny the existence of God and that science and faith can actually enhance one another. In short, nothing prevents one from being a person of both faith and science. For non-experts such as Dennin's intended audience, he felt the need to "find a more common language, while still communicating the original complexity and the depth of these ideas." From time to time, when certain technical terms seemed to be crying out to be used for their precision and usefulness, Dennin did so, while providing in-text definitions for non-expert readers. Among the many topics Dennin deals with are the classic questions that surface in any discussion of faith and science. He has a chapter that deals with "God in a box," addressing the limits of the controlling image. Another chapter discusses creation from both a scriptural and scientific perspective. He also explores evolutionary science and Scripture; the scientific law of probabilities and the miraculous; and closes with a chapter entitled, "God's Dice," which discusses free will and determinism. All of this may seem complex, but Dennin actually communicates quite easily and helpfully what every educated Catholic should know about the relationship between science and faith: that there's nothing in the traditional teaching of the Catholic Church that in any way contradicts good science. After all, there would not be any science if there was not a God who created the universe and mankind. I highly recommend this book both for adults and for high school and college students, all of whom, through this book, can experience the joy of seeing the beauty of science, while also being able to explain to others the natural law that we find laid out for us in the universe by a living and loving God. Rev. John McCloskey is a Catholic priest. This article appeared originally at the National Catholic Register.